Cotton webbing is an environmentally friendly alternative to synthetic webbing. It's made from cotton fiber which is a renewable resource that's good for the planet. Cotton fiber is also easy on sensitive skin. It won't chafe or irritate skin like some other materials can. Cotton Webbing also absorbs moisture and sweat readily and is naturally breathable. This heavy cotton webbing offers strength without a slick synthetic feel. The natural cotton webbing is also dyeable, so it can match whatever you need! Notes on Use: It is best to use 1 inch hardware with this cotton webbing. D-rings, buckle, triglides etc. are sized by the webbing or straps they are meant to be used with. Please note that some rolls may contain factory splices. If you need a continuous roll without splices, please let us know. 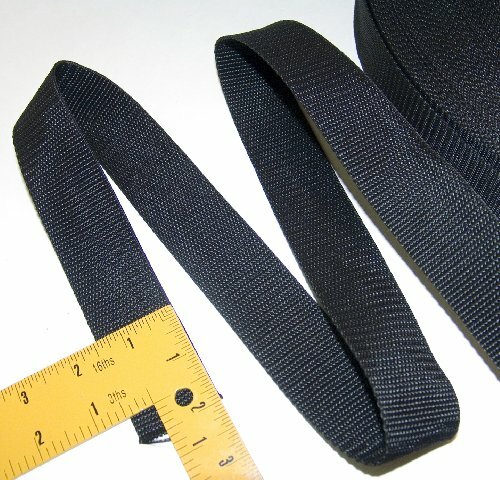 Black Polypropylene Webbing 50 Yards x 1-inch; 1" Wide Black Polypro Strap Webbing; Great for Bags, Handbags, Backpacks, Outdoor Gear; Collars, Leashes, Halters, Sporting Gear & More Many people prefer to use polypropylene webbing because it is soft and flexible. It is waterproof and suitable for many outdoor uses. 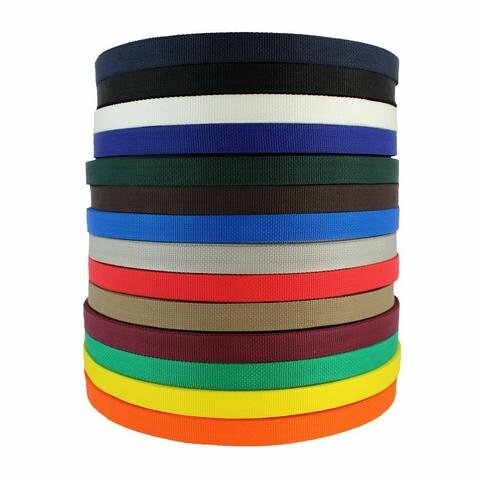 It is commonly used in bag handles, backpack straps, tent fastens, sleeping bag ties, life jacket straps, dog collars & leashes, animal halters and harness, hammocks, cargo fastens, sports equipment, diving gear, shoes, belts, and more. It won't stretch like nylon so is preferable to nylon for many of these uses. And it has more resistance than nylon to damage from grease, oil and chemicals. 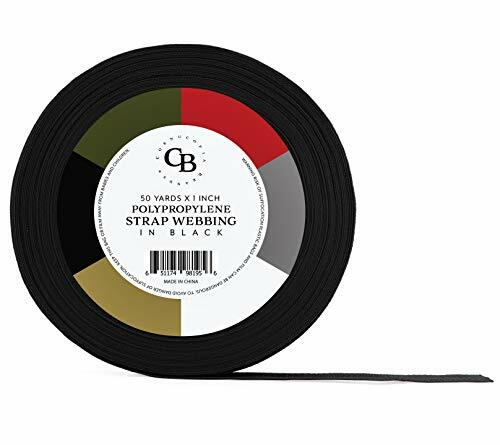 We offer a convenient 50-yard roll of black polypropylene webbing in a 1-inch diameter. This works well with D-rings and buckles that are made for 1-inch diameter. 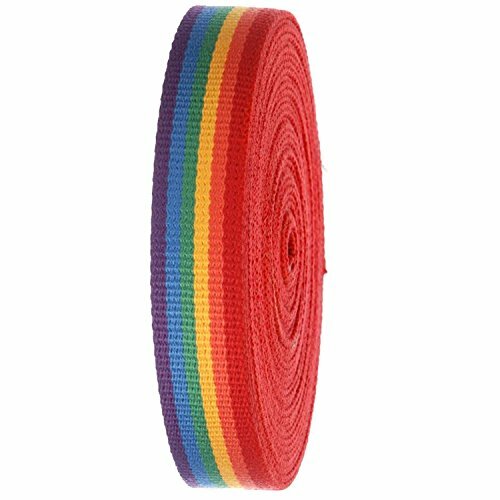 The complete roll weighs 1 pound and has a 10-inch diameter before cutting. The strapping is 1-inch diameter with a 1.2mm thickness (manually measured so not exact). Color is black. Approximate breaking strength is 500+ pounds but that varies due to application of the product. It is normal for rolls to occasionally contain factory splices. 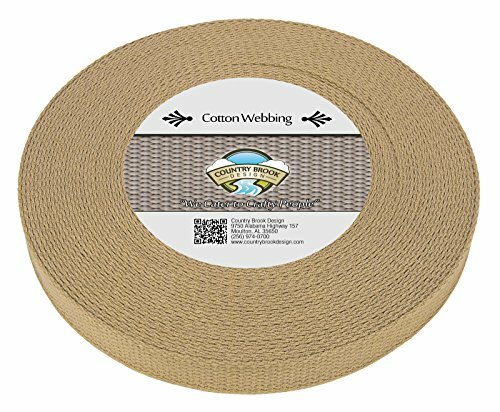 Country Brook Design's Heavy Cotton Webbing is a natural, organic alternative to conventional nylon and polyester. Lightweight, all-purpose and versatile, cotton webbing is made from renewable resources. It is a great alternative that is good for our planet. Cotton fiber is easy on sensitive skin and won't chafe or irritate skin like some other materials can. A natural moisture wick, cotton webbing will absorb moisture and sweat. It is a naturally breathable material and allows air flow throughout it's weaved design. Used in a number of applications, cotton webbing is versatile enough to be used in home furnishings, totes, belts, apparel, and pet accessories, among many other projects. Due to natural variations in cotton fiber, cotton webbing is best used in projects where tensile strength is not important. For this webbing, it is best to use 1 inch hardware; such as D-rings, buckles, or triglides. Please be aware that some rolls may contain factory splices, but we would be more than happy to get you a continuous roll; just let us know when ordering! Country Brook Design cannot be held responsible for misuse of our product. It is the responsibility of the purchaser to determine the suitability of the product for their use. Our canvas webbing is made of cotton/acrylic blend, has a nice texture and is very durable. The fabric is extremely colorfast and bright. This textile will melt when burned giving it durablity of nylon with quality texture of cotton. Canvas webbing can be used for military belts, bag and purse straps, crafts, climbing, and utility uses. Width is 1.25", standard military width. Available in 3, 5 and 10 yard rolls. Rolls are one continuous fabric. Polypropylene Webbing, 1.5" Wide Black, Sold By The Yard Need more? Each purchase is for 3 Feet, we will send you 3' lengths, uncut, per order. This sale is for 1 1/2 wide Polypropylene webbing. Rolls of 100 yards are available if needed. E-mail us for more information. 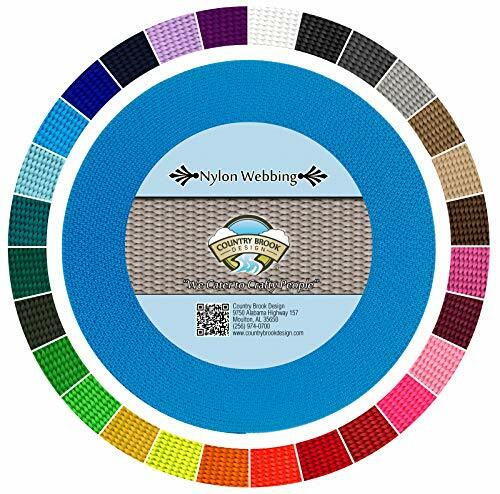 Nylon webbing is a heavy-weight material and is stronger than polypropylene webbing. Some of the projects this webbing would be good for is harnesses, military and survival applications, animal collars, tent straps, tow ropes, backpack straps, and much more! On top of its many uses, this webbing is also easy to take care of as its machine washable (recommended to dry on low heat). With the soft, lustrous feel on top of its strength, it makes this webbing a great fit for many projects! We recommend you use 2" hardware with this nylon webbing. (D-Rings, Buckles, Triglide slides, etc. ) These hardware items are designed with a specific size of webbing in mind. Some rolls may contain factory splices. Want more Yard Webbing similar ideas? Try to explore these searches: Designer Dog House, Performance Synthetic Gear Lube, and Acura Integra Exhaust Gasket.